The 14th annual Japanese Classic Car Show (JCCS) was held once again in Long Beach this year. A perfect mid 80 degree Southern California weather, Long Beach’s amazing backdrop and classic Japanese cars. It’s hard to ask for a better meet. In just the first row these two 240z’s caught my eye. The bright orange paint with Jägermeister livery was a stunning build. The widebody and deep dish wide wheels to match made quite the impact. On the other hand, the silver one was a clean and simple classic looking build. Which would you choose? Hard choice for me. And whats a Japanese Classic Car Show without some Bosozoku action? This car caught a lot of attention on the front row. There was plenty of vendors at the show including people selling model car kits, merch, hot wheels, etc. My friend actually purchased this Calsonic R32 model that was incredibly detailed. After he swiped his card the person began to package it then dropped it straight onto the concrete. A couple little pieces broke not too big of a deal, but for the price it wasn’t worth it. They ended up giving him a full refund and the situation was all laughs after for us. Mazda came out with an amazing collection of cars. Of course 787 stole the show. Such a stunning piece of engineering. I’m amazed when I see this car in person, the square sides with ducting are beautiful. They also busted out the 1989 Club Racer Miata from the vault. Mazda’s interpretation of a “hot rod” style Miata built to showcase the hidden potential. Interestingly this car is a pre production model and has some very subtle differences to the actual production vehicle, but all of those are for another time. For now let’s enjoy those streamlined headlights, low hanging front bumper, widebody and body matching yellow wheels. This car aged in an odd way, it definitely stands out as a 90’s piece of art. 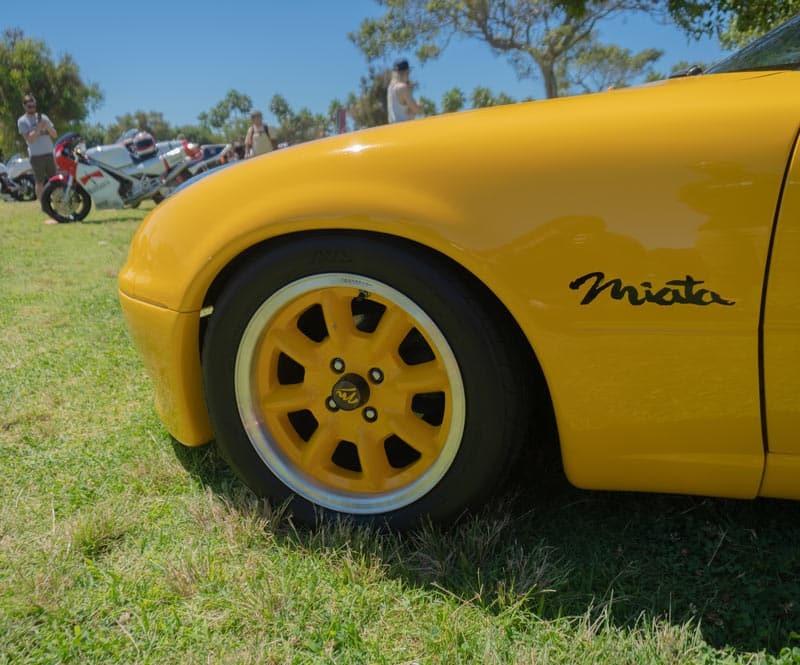 But many aspects like the streamlined headlights, rear spoiler and wheels have become staples as popular upgrades for the Miata. Powered By Rotary. Just look at this livery, as classic as it gets. And there was plenty more rotary where that came from. The lineup of FD RX7’s was stunning. Ranging from an all original example all the way to some incredibly tuned machines. This FC’s livery combined with the headlights and RPF1’s was one of my favorites of the day. Don’t worry I got some Supra’s for you. It’s impossible to leave this car out of the mix when covering a classic Japanese event. These two were no exception to the quality of builds found here. Speaking of Toyota this lineup of first generation MR2’s was incredible. The white AE86 is a staple at that these kinds of shows, this one shows why. It’s perfect. The other Corolla was just such a different build I had to give it some appreciation.